Decathlon 2000 › News › Götzis 2014 - why 8544? When Trey Hardee was asked how important this (first) competition of the season was, he answered that the hypo-meeting was very important to him. The result would even determine his season! Trey looks fit, looks very strong. 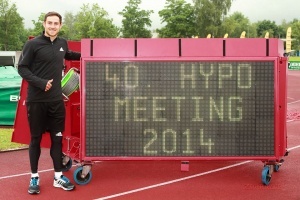 Two years ago another thirty-year old athlete – Hans van Alphen - broke his own personal record and won the meeting. I’m sure Trey is not to be underestimated. Theoretically he’s worth 9211 points – the sum of his pb’s. In this context he’s todays number 1 (or 2 if you count Eaton in). Some people ask if it is wise that Ashton Eaton “takes a day of”. Someone said to me “What if we have here a story of the turtle and the hare”. I answered that the comparison can only be true for half a part of it. The hare is indeed not competing this year but on the other hand Trey Hardee certainly isn’t a turtle. Watch out for him. Can he take over the world record? That would be very nice! And the hare? Wait for next year! Many decathletes will ask Ashton Eaton to try the hammer throw for one year – that is 2015 – but from what I heard he won’t bite. Question. Trey will you continue like Roman Sebrle, will you compete till your 36? If I can … yes. As long as I stay healthy I will try. The day that my body stops, I’ll stop competing. Roman of course was an amazing athlete. Six times over 8800. He did – how much? 49 times 8000 and 20 times 8500. First over 9000 and gold medals in every major championship. I won’t do what he did but I will continue and try to perform at high level. Was he the greatest (Roman)? He was a great athlete and Ashton is a great athlete. I think if they could have performed at their peak together the world record would now stand much higher. Do you think your personal record can be broken? Absolutely. I think I can. You look sharp, I like to ask athletes about their best bench press. Not this year but my best is 160kg once and 145kg twice in a row. Events in which you eventually can do a pr? I suspect at least seven of them are still possible to improve … maybe more! Maybe a closing remark. I think Andrei Krauchanka is in great shape. He wasn’t at the press conference. Last year he said he was building up for 2014. Nevertheless he won the Combined Events Challenge 2013. This winter four personal records – shot put, high jump, a heptathlon record and a day 1 hepta record. If he wants the national record this year he has to break the 8735 from Hamalaïnen. If he will do that in Götzis? We’ll see, we pray for good weather to the weather gods! Götzis 2010: “Singing in the rain!" 2014 Combined Events Annual‏ Adam Sebastian Helcelet loves Decathlon but hates 1500m Ashton Eaton going to break the world record again? Damian Warner: Online interview 2014 Eelco Sintnicolaas needs to focus on speed and power Götzis 2014 - a great experience again! Götzis 2014 - why 8544? Heptathlon news like Pole Vault news Interview with Maicel Uibo’s coach Petros Kyprianou Keisuke Ushiro scored 8308 points in Nagano More photos: Decastar 2010-2011 Romain Martin: On the Way to Rio Olympics Rudy Bourguignon: Online interview 2014 Rule change proposals Combined Events to IAAF Talence Decastar 2013 - Day 1 - All the athletes Talence Decastar 2013 - Day 2 - All the athletes Willem Coertzen: Decathlon is full-time job World Indoor Championships Sopot 2014. Review.